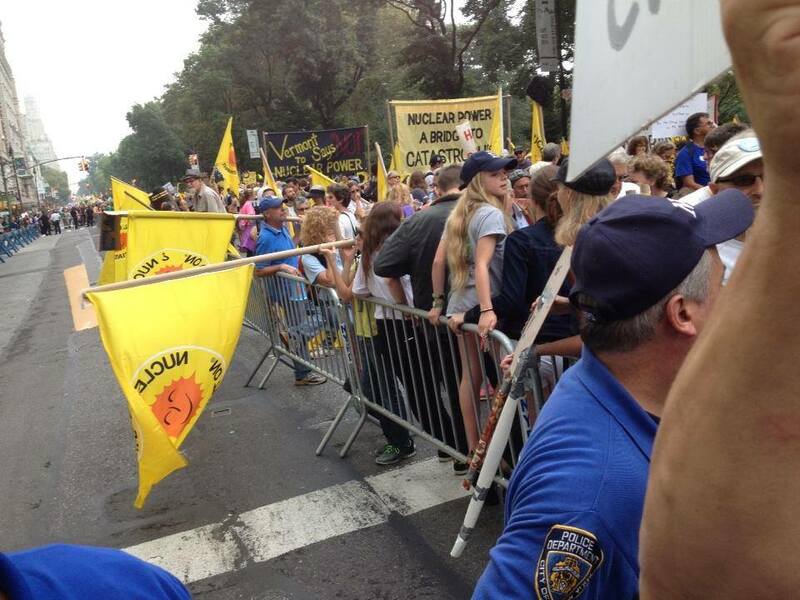 The Cape Cod portion (and a few South Carolinians) of the Nuclear-Free, Carbon-Free Contingent preparing to march. No matter how you look at it, 400,000 is a lot of people. It’s not the largest crowd I’ve ever been in: that was the nearly two million at President Obama’s first inauguration. Nor the largest demonstration: that was the million at the 1982 nuclear freeze march in New York City. And the 1970 Atlanta Pop Festival I went to was somewhere around 800,000 (but, of course, who remembers that one? Probably not even many who were there…). But it’s still a lot of people. And to put it in a more appropriate perspective, it’s as many or more people than participated in some other seminal events that changed history and the trajectory of American politics and lives: the 1963 civil rights March on Washington, the 1969 Woodstock festival, the November 1969 anti-Vietnam war mobilization, the 1979 No Nukes protest in Washington after Three Mile Island. NIRS’ Board Chair Chris Williams ended the rally with a rousing call to action. Two days later is far too early to pronounce, or even take a legitimate guess at, the ultimate impact of Sunday’s People’s Climate March. Perhaps the world’s governments will simply ignore the legions in the streets–and in the streets of cities and towns all across the world–and continue to do little or nothing to take the steps necessary to quite literally save our planet. That would be a tragedy of astronomical proportions. But perhaps September 21, 2014 will be recognized in the history books as the day the tide began to shift, just as the 1963 March on Washington is now considered the day civil rights became a mainstream issue, as the 1969 anti-Vietnam march heralded the beginning of the end of that monstrous war, as the 1979 No Nukes protest helped turn public sentiment against nuclear power and kept the nuclear industry at bay for decades. The key will be the follow-up. If the march is seen, especially by its participants, as an end in itself, it will become just another day not noted in any history book. But if the People’s Climate March ushers in a new era of citizen action on climate–as we hope it does–then yes, it will be likely to qualify as the historic event its backers (including ourselves) promised. That is just as true for the Nuclear-Free, Carbon-Free Contingent to the march. Not only was the overall march itself historic in terms of turnout, so was the Contingent. Largest Climate March ever. 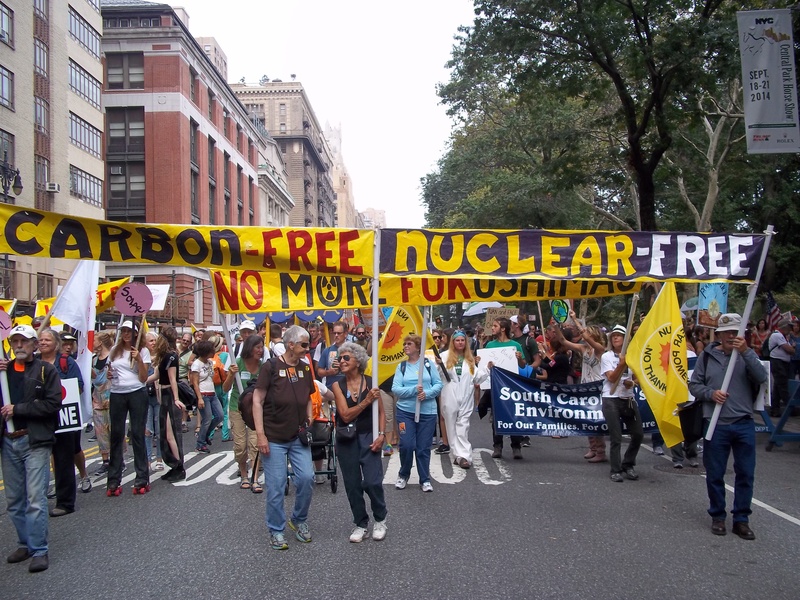 Largest Nuclear-Free, Carbon-Free action ever. By the time the rally ended but well before the marching began, the entire city block was wall-to-wall people. When I arrived at our assembly spot at 7 am to set up the stage and sound system, the block of Central Park West between 73rd and 74th looked very big and very empty. That was a lot of space to fill with people. And, by the time the Contingent’s rally kicked off with songs from Raging Grannies at 10 am, it still looked very big and largely empty–only a couple hundred people had shown up by then. I’ll admit to being a little nervous. NIRS had brought 650 flags and 200 posters to distribute, and other people had brought their own banners and other materials. That would have been a lot of stuff for a couple hundred people to carry. I needn’t have worried. As buses arrived, as subways disgorged tens of thousands of passengers, the block began filling. By the time the rally ended at 11:30, the flags and posters were long gone–we could have used another thousand or two. There was no room left on the block either. There were thousands of us pressed together, ready to march. It was beautiful, it was awesome. But what matters most, what will determine whether the Contingent’s action was just a great day or something that will matter long term, is how we follow up. Now the real work starts. The Himalayas marching band joined the Contingent and kept the energy level high throughout the very slow 2+ mile march route. That’s why we built in a national strategy meeting on Saturday afternoon for everyone who could arrive a day early. It was extremely useful–and good things are going to come out of it. Better and faster communication among the grassroots, better coordination and strategizing, especially for the upcoming battles in the states against the dirty, aging and uneconomic nuclear reactors of the 20th century that threaten to hold back deployment of the clean energy technologies that will not only end the threat of nuclear meltdown and the everyday radiation releases from every reactor, but will be the exact technologies that will effectively address our climate crisis. It’s not automatic, but a clean energy system is inevitable. The question is whether it will be deployed in time. In time to prevent the next meltdown, in time to slash the carbon and methane emissions that are smothering our home planet. That’s the job before us now, that’s the follow-up we must accomplish for September 21, 2014 to make the history books–as indeed it deserves. If you’d like to receive GreenWorld via e-mail, send your name and e-mail address to nirs@nirs.org and we’ll send you an invitation. Note that the invitation will come from a GreenWorld@wordpress.com address and not a nirs.org address, so watch for it. What a gigantic grand march it was. 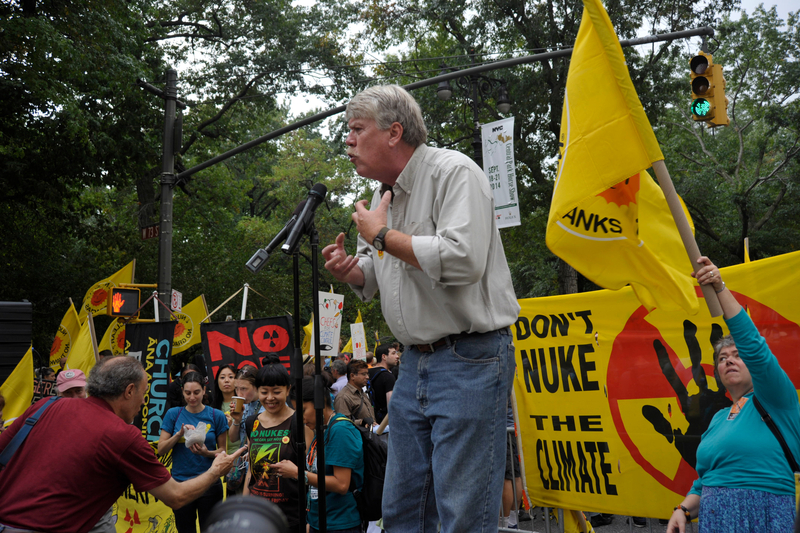 I watched network news on it and saw on one program an eye-blink video slice of the no nukes marchers with banners and signs. Was surprised by Goodman’s Democracy Now on-site video treatment of the march, where she interviewed marchers at random plus specially selected Bill McKibben and other climate spokespersons— but she never interviewed anyone from the No Nukes contingent. She did speak to one man, not evidently from the No Nukes group, who opposes nuclear weapons. Goodman is anti-nuke. Her website has reports that include a few on the Fuku fiasco, but the most recent of these reports is dated 2013 and is about closing VT Yankee. Considering that the Fuku fiasco gets worse by the day, I wish she would update her reporting on it.